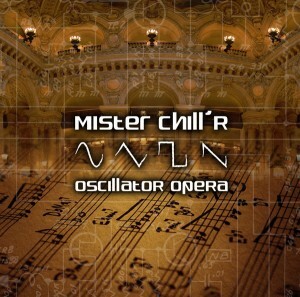 In Oscillator Opera, a classically-inspired psystep release, Mister Chill’R breaks new ground with an amazing blend of classical instrumentation and tripped-out noises with the help of Planewalker’s psychedelic sound design skills. Half orchestra, half banging dance beat, the tracks on this release feature growling bass lines, operatic vocals, orchestral percussion and strings over a bed of strong dubby backbeats with psychedelic trance kick drums. The release begins with Oscillator Opera, an bombastic exploration into what Mister Chill’R calls “opera-step”, reminiscent of the soundtrack to the Fifth Element movie. It then takes a moody turn with Positronic Pizzicato, an epic song with a soundscape of psychedelic synths and string ensembles. Berkelium Bel Canto brings a jazzy, urban feel to the mix and blends it with bubbly, wobbly basses and a haunting Gregorian choir chant. The release finishes strongly with Oscillator Opera, the namesake track showcasing violins, synthetic drum hits, agogo bells and brain-tickling aggressive synth leads. One of the original psystep efforts, Oscillator Opera will make you want to get down and dirty in your tuxedo or ballroom gown! MP3 Download | FLAC Download | WAV Download · Download count: 5,239. This is outstanding. Beautiful use of melody and voice against the bass line. Original, fresh and beautifully constructed.